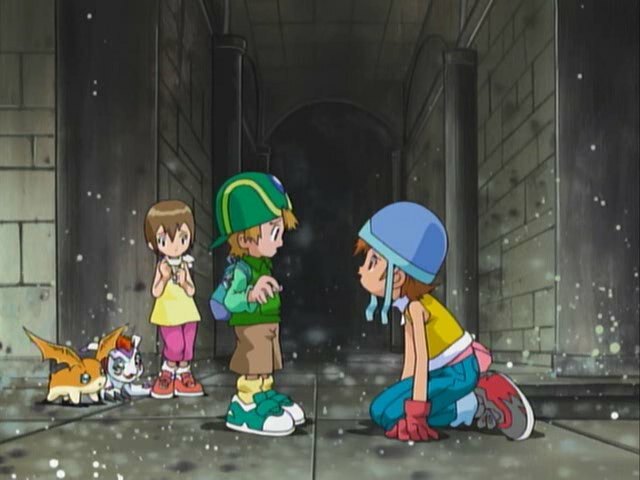 In this episode, the gang's back together, but Piedmon systematically takes out one kid at a time until only TK and Kari are left. Yeah, he's screwed. For a climactic episode, this one contains high quantities of ridiculous. Piedmon himself is just mad, with his clown/magician motif simultaneously captivating and wholly inappropriate for a final boss. The dungeon features a trapeze set and a floating rope, and apparently the final Dark Master is an avid keychain collector. That said, even with such odd elements, it's a thrilling ride from start to finish. While the first three Dark Masters all struggled against a single Mega, Piedmon handles both WarGreymon and MetalGarurumon with ease. The battle lasts long enough to show some teamwork between the two, probably an important note given the last time they were on the field together. Their success is short lived, however, as Piedmon busts out the white sheet. Despite his evil grin when tossing it, the Megas foolishly run right into it, and their partners run right in after them. KEYCHAIN'D! I don't get the keychains. Whether he's supposed to be a clown, court jester or joker, what do keychains have to do with any of those? Granted, it's a good visual representation of the captives, they clip onto Piedmon's belt and they're nice and tangible for Gomamon to paw at when he gets a chance to swipe them. Either way, the thought of being turned into one is absolutely horrifying. Joe, Izzy and Tentomon get the treatment on the trapeze. 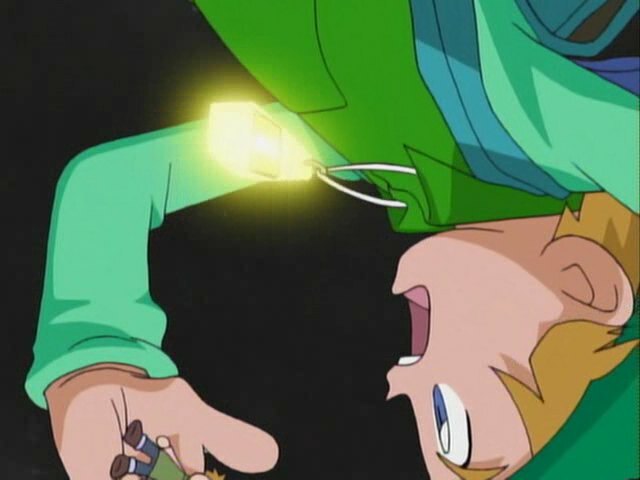 Also horrifying- Sora and Kari hiding under the floorboard as Piedmon stabs at them repeatedly. It's one thing when the Digimon are under fire. It's downright brutal to watch two girls nearly get impaled from above. It's like something out of a horror movie. Angewomon and Garudamon help them escape, but wind up getting keychain'd themselves. Sora gets a spontaneous moment of extreme heroism, imploring TK to take Kari and run while she stays to defend Piedmon. It's a powerful moment, and a credit to Sora for sacrificing herself for the tykes. Let's not overlook TK, who has to face going from the kid who must be protected to the one doing the protecting. Here's the thing... what does Sora expect to do? She can't possibly buy enough time to be worth giving herself up. Even stranger, she chastises Gomamon for wanting to do the same thing, even calling him powerless without Joe and saying his sacrifice would be worthless if his partner didn't escape. This after her own partner just did the exact same thing! Worth mentioning that poor Gomamon looks totally lost hearing all this, not that it matters as both the pot and the kettle are keychain'd quickly. The lone positive is that they swiped Matt's keychain and got it to TK. Piedmon catches up to TK and Kari quickly, takes out Angemon and sends them all falling to their deaths. It's that keychain that TK uses for inspiration, imagining words of encouragement to convince himself that since he's all that's left, he can't quit. Boom goes the Crest of Hope! Angemon evolves to Ultimate, saves TK and Kari and starts the beatdown. MagnaAngemon proves to be as much of a game-breaker as Angemon was in episode 13, not only knocking Piedmon into next Tuesday but casting Esuna on everybody. Piedmon is apparently offended at being called a clown, even though it's in the name of one of his attacks. There's a random bit with Centarumon and Gennai riding a Mekanorimon standing in front of a wall of fire and talking about a new prophecy. It's very out of place... although the visual representation of a network firewall is pretty clever. What exactly did Gomamon expect to accomplish by stealing a single keychain? It clearly helped TK center himself, but there's no way that could have been expected. What would have been gained if he had grabbed, say, Tentomon instead? 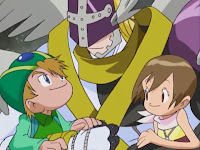 Even though TK and Kari didn't appear to get that far ahead, they are helped out by two random shots of Piedmon standing in place and laughing. MagnaAngemon may be a servant of all that is holy, but he's still capable of action hero quips while fighting Piedmon. How can someone so good be so badass? Gotta love how Gomamon and Tentomon evolve to Ultimate just to get a few shots in on Piedmon, even though it was clear the digidestined were going to win this battle. Ermm...it's actually Unimon that Mimi comes riding in on. Pretty sure Gomamon was just trying to ruin Piedmon's day by making sure he couldn't get a full collection. "with his clown/magician motif simultaneously captivating and wholly inappropriate for a final boss"
I don't know, Squaresoft made it work in Final Fantasy VI! Not to mention the GODDAMN BATMAN has a mad clown for his most well-known enemy.